Last night, I dreamt that I was seated on the floor of a carpeted apartment. Also seated beside me, on my left, was my wife. We were both facing and praying to a picture of God Skanda that was placed on our altar in the apartment [See picture on right]. It was like the long small brown coffee table in my mother's house. After we prayed, I got up and turned on the radio that was located beside the altar. To my surprise, it was my voice singing Kolaru Pathigam. So, I turned around to my wife and said, "Hey, Let's sing Kolaru Pathigam." So, we both sat in front of Murugan and continued to chant Kolaru Pathigam. I then awoke. This dream has a significant meaning to me since my wife and I were undergoing some personal obstacles in our life. And this song (Kolaru Pathigam) is a remedy to prevent karmic obstacles from causing misery in the lives of devotees. 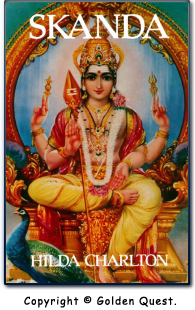 So, Bhagavan Skanda showed us what to do to overcome the difficulties in our life  do daily parayanam (devout singing) of Kolaru Pathigam as part of our sadhana (spiritual practice).